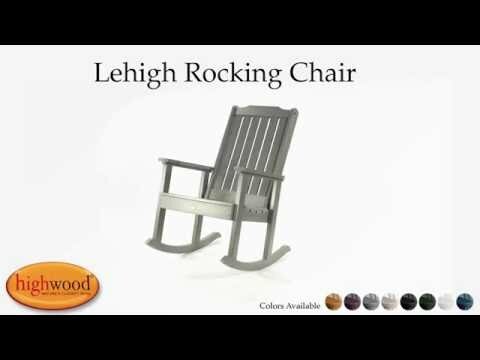 The Lehigh Rocking Chair has developed quite a fan club and is part of the Lehigh Collection. The elegant styling of the Lehigh Collection lends itself beautifully producing a handsome chair that stands impressively. The smooth, gentle rock of the chair makes it difficult to leave - just refill your iced tea and drift away. This product has been load tested, per ASTM 1561-03 (2008) standard for Outdoor plastic furniture, and has a 500 pound weight capacity. Some assembly is required (see assembly guide). The rocker has authentic looking wood grain texture. The chair seems sturdy like it should last. I was tired of refinishing our previous rocking chairs so we tried Highwood. Expensive but worth it. I am loving my Highwood porch with 2 rockers, 2 tables and 5’ swing! My perfect farmhouse porch. These rockers have changed our lives! My husband and I have switched from being patio dwellers to front porch people. The sun hits our backyard so strongly in the evening so we spent years planting trees and looking into sun shades and awnings. Little did we know we could just create a front porch escape. We purchased two rocking chairs, a rug and some accent pillows. All we need now is a small matching table for refreshments.